The Brooks family is one of the more gossiped-about families in Witchita. The latest buzz is that they are sending their oldest daughter, Louisa, only 14, to New York to take dance classes. Neither Mr. or Mrs. Brooks is going with her, though; instead, they’re seeking a respectable married woman to go as her chaperone. Many of the women of Witchita see this as a somewhat demeaning request, they are not the Brooks’s servants. For Cora Carlisle, however, this represents a huge opportunity. Her boys are out of high school and working on a farm for the summer, so she doesn’t have children to care for. In addition, New York holds a special promise for Cora, the promise of discovering something about her past. The Chaperone is an incredibly engaging story of self-discovery. Cora is a fascinating character with a multifaceted personality and a complex personal history. Louise Brooks, who would eventually be a famous silent film start, adds an extra dimension of interest to the story, but Cora is really the heart and soul of The Chaperone. Moriarty pulls her readers immediately into Cora’s life, revealing pieces of her past in a way that is realistic and authentic, while also keeping the reader intrigued. The inter-war period of American history doesn’t always work well for me in historical fiction, but I found myself completely lost in the world and characters that Moriarty put on the page. 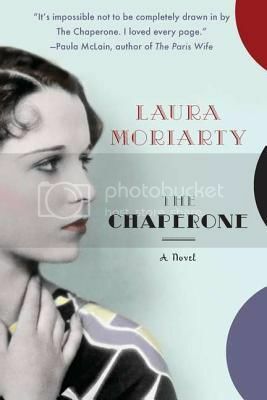 The Chaperone is wonderfully written and plotted with characters that leap off the page. Highly recommended. I’m reading, and loving, this one right now! Oooh, I’m pumped to read this one! I love that time period, and the cover is so snazzy. Hope I love it, too. I’m starting to seet his book come up in conversations around town since it’s about a local celebrity. I wasn’t too interested in it, now I’m not so sure. I am hearing really good things about this book. I really want to read it at some point! I loved Cora too, she was such a great character with so many layers. This sounds like a book that I would absolutely love! Yes, I think you would!